Once ‘Tamasi Devi’, withdrew from Vishnu’s consciousness, he stirred on his serpent-bed & in moments his form was again as splendid as a thousand suns. When Narayana opened his eyes and saw Brahma trembling with fear, he inquired what was bothering him & how could he help. Lord Narayana saw Madhu – Kaitabha & roared like the thunder of the storm that could end the worlds. He challenged them for war to save Brahma from their wrath. The battle between Vishnu & the demons born from his ear wax was ferocious. Vishnu battled the sinister brothers without rest for five thousand years till he grew tired. When he finally paused to rest & meditate he learnt of the Devi’s boon to the Asuras. He learnt that Madhu-Kaithabh can die only when they themselves willed it. The Blue God was perturbed; for who wants to die, even in the direst circumstances? He realised how vain his battle with the wax-demons had been. Narayana folded his hands and called upon the Devi for help. Vishnu went back to fight and they began to strike one another again, with blows beyond description. Very soon, the Devi manifested amidst them. She was enticement personified! The enchanted Asuras had eyes only for the Devi now. They stood gazing at her, aroused past endurance and not knowing what to do. 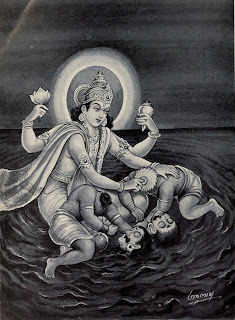 Taking advantage of the situation, Vishnu praised them for their bravery and granted them a wish. At once, the Devi vanished, and the Demons realised they had been tricked. To save themselves from being killed, they granted the boon to Vishnu with a condition that, Vishnu would kill them, but it must be on solid ground where there isn’t a drop of water! And of course, they believed they could survive since there was no dry place in primordial sea. Until instantly, Vishnu expanded his own thighs, so they were a bright, dry island floating upon the unfathomable sea & Madhu and Kaitabha had no choice but to lay their heads on Vishnu’s thighs as on an executioner’s block, and, with his Sudarshana Chakra the Narayan struck their heads off & thus saved Brahma’s life. Madhu and Kaitabha represent craving and aversion born out of inertia and Vishnu (Narayana) represents the ever-blissful Consciousness pervading the entire Creation. This story tells us that when consciousness returns to the source & turns inwards for knowledge, then it is able to overcome all distortions and once again merge into Love.